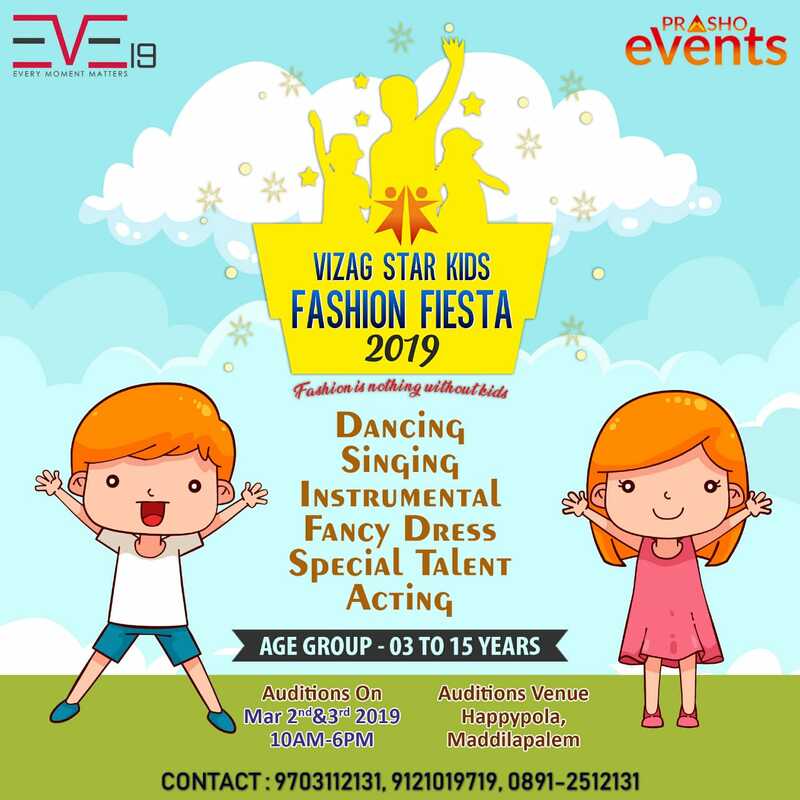 Vizag Star Kids Fashion Fiesta 2019 Season 2 is a unique kids Contest. We are conducting auditions for the kids on Slot 1 : Feb 16th and 17th , Slot 2 : Feb 23th and 24th , Slot 3 : March 2nd and 3rd ( tentatively). The final kids who are selected from the auditions will Get a chance to Participate in Fancy Dress Competition Followed by live Performances like Fashion Show Etc. in the Finals. Winners will be awarded and Participants will be given Certificates in the finals. Check Terms and Conditions section for more information. 1) Your child must be In the age category of 3-15 years to enroll in the contest . 2) Registrations will not be accepted without payment of Rs 499 as a non refundable fee. This enables team VSKFF2019 to ascertain the number of children attending the contest. 3) Team VSKFF2019 cannot be held responsible for missing or non features photos in irrelevant formats. 4) No refund will be given upon cancellation of the entry or missed audition. 5) Team VSKFF2019 has the right to cancel/ alter or reschedule activities due to unforeseen circumstances like weather or safety issues. 6) Selection and short listing of the finalists will be done on the criteria given in the contest details and the judges of team VSKFF2019 will be the final selecting authority in all cases. 7) For further promotion and portfolio charges are applicable. 8) Organizers reserve the right to disqualify any entry if it breaches terms and conditions. 9) Parents agree that under no circumstances will the team VSKFF2019 or its sponsors be responsible or liable to you or any other person or entity for any direct, indirect consequential loss or damage. 10) Team VSKFF2019 will use the photographs of kids for promotional activities. 11) In the event of dispute, the decision of Team VSKFF2019 is final. 12) Contestants only have to bear the travelling and other expenses required for the contest. Event completed or sold out.